I'm a sucker for death metal from overlooked scenes. So when Horror Pain Gore Death Productions announced the signing of Costa Rica's Advent of Bedlam, I couldn't wait to hear them. 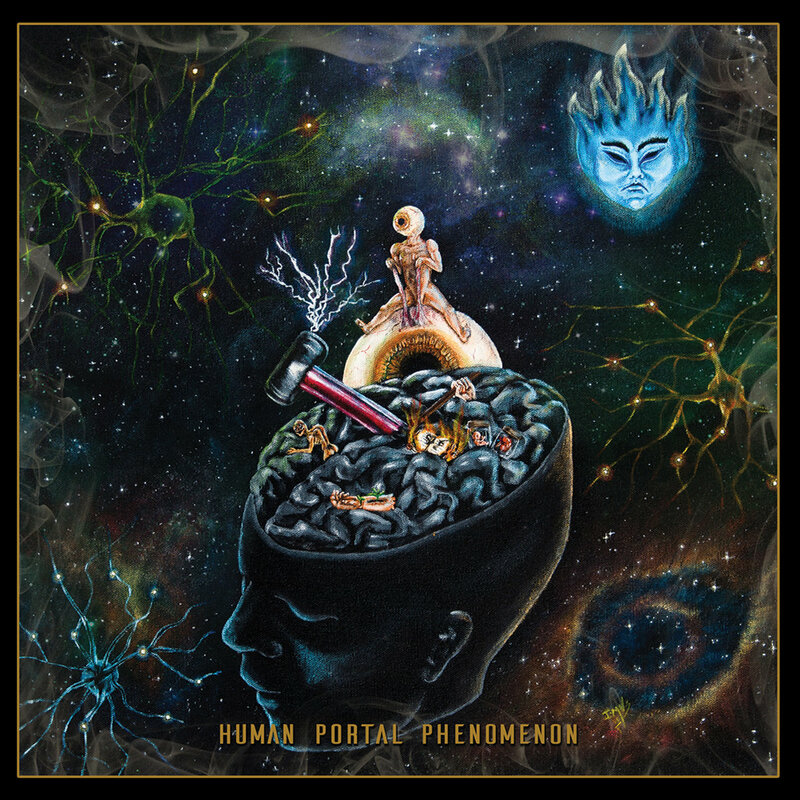 Their latest release Human Portal Phenomenon is an antidote to the run of the mill albums that have been clogging up my inbox lately, combining dissonance with speed and sombre melodies in a way that I haven't quite heard before. Eager to delve deeper into the band and their scene, I reached out to find out more. Guitarist Max Gutierrez was kind enough to answer my questions. Dreams of Consciousness: What is Advent of Bedlam? Advent of Bedlam is a Death Metal band from Heredia, a very small and beautiful city in Costa Rica, Central America. When defining our musical identity, we like to explore and play extreme music and we try to set no boundaries in the way we create music, so we mix brutality with melody - not happy melodies, but more of a furious and sentimental approach. Advent of Bedlam is: Max Gutierrez – guitars, Fabian Salas – guitars, Luis Ortiz – drums, Joseph Villalta – bass and Roy Zumbado - vocals. DoC: Please give a brief history of your band- when did you form? What did you set out to accomplish? Advent of Bedlam was born back in November 2009 as a Death Metal band, with the main idea to explore extreme music. We have self released two albums (Behold the Chaos – 2010 and Flesh Over God – 2012) and one single (“Creatures of Yore” – 2016). Horror Pain Gore and Death Productions released the Human Portal Phenomenon album on Apil 2018. We have also toured Mexico, Central America, Colombia, Germany, Czech Republic, Spain, Portugual and Slovakia and we have shared stage with bands like Suffocation, Napalm Death, Dying Fetus, Masacre, Malevolent Creation, Exhumed, Destroyer 666, Kalmah, Ratos de Porão and Rotten Sound among many other amazing bands. DoC: Advent of Bedlam originally came from the band December's Cold Winter. What led to the change? Is Advent of Bedlam a continuation of December's Cold Winter, or do you see the two bands as separate entities? They are definitively two separate entities. DCW was a Black Metal band with keyboards that evolved to a Death Metal band without that instrument, this led to a evolution of the way we used to write music and lyrics. Then, on November 2009 and after many line up changes, we changed the name to Advent of Bedlam and focused to get more international exposure and tour opportunities with this new band. DoC: You recently released your third album, Human Portal Phenomenon. How long had you been working on it and what was the writing process like? How would you compare it to your earlier releases? This is definitively our best opus where I personally think we were able to reach the level of composition and execution we have been developing. We started to work on it back in 2012; all the music was composed and written by the five members of the band inside the rehearsal rooms at Cavan Studio, our headquarters. This is a solid album born thanks to the mixture of sounds, melodies, rhythms and disharmonies each of the musicians execute, contributing to improve each single riff and reach some type of particularity. DoC: The production on the new album is great. What were the recording sessions like? Thanks a lot for the compliment! Honestly I’m really proud of the production of the Human Portal Phenomeon album. All the sessions happened at my recording studio called Cavan Studio, an SME (small-medium enterprise) located at Heredia, Costa Rica since 2009 and home of all our previous albums. The mixing and mastering processes took place early this 2018: I got really inspired once the deal with HPGD was locked so I focused all my brain and heart on the production of the album. DoC: Human Portal Phenomenon is being released internationally by Horror Pain Gore Death Productions. How did you get involved with them? It has been really a pleasure and honor to work with Mike and HPGD. It was a smooth negotiation since the moment both parties got in touch, and everything went great - we even got our copies before the scheduled release in Costa Rica! Unlike previous releases where we did all the pressing, distro and promotion, we needed to release the new album with the support of a hard working label, so this is a very important step for us. DoC: As I don't know much about Costa Rica, please give me some background on the scene. What is the scene there like? Is there a unifying character to Costa Rican metal? Would you say that being from Costa Rica influences your music? If so, how - and if not, why not? Costa Rica has an unique underground scene with many great bands both experienced and newcomers. We are also getting better and better productions with each release, and we are starting to get constant support from labels from many parts of the world that are supporting and releasing Costa Rican material. What we are lacking is a local/regional circuit (with logical viability) where bands can take the road and get all that healthy touring experience needed to improve and understand that we, bands, are part of an ecosystem and we need to interact with it in order to reach the next level. For Advent of Bedlam, being from Costa Rica means the daily need to be better musicians, better professionals and better partners as we use to find extra steps to walk in order to develop our musical career. DoC: Every regional scene faces its own unique challenges. What would you say are the difficulties in being based in Costa Rica? I used to think we were really unlucky because, many times, Costa Rican bands needed to pay for plane tickets or days off fees on tour in order to get international experience. Then one day I realized there were bands from Australia traveling to North America or Mexican bands heading to Chile and I understood that’s part of the fee that bands far from the “mainstream regions” (US and Europe) needed to pay in order to be part of a bigger scene. As I said before, there are extra steps to walk when you are from a regional scene. I think the main difficulty in Costa Rica is the lack of an infrastructure that allow bands a constant rhythm between each release and its promotional phase (where touring is so important); a band should be able to release its music, sell enough merch/get payment from promoters/get Digital Distro income in order to recover the investment and start a new process; always willing to grow its own fanbase. Unfortunately, we are a country of 5 million where Metal is not strong enough to support this kind of efforts, therefore there’s the need to go out and reach those objectives outside our frontiers. DoC: If you could tour with any band, past or present, who would it be? On a personal level it would be great to tour with Sepultura and Pantera back in the early Nineties. Nowadays it should be amazing to share that type of experiences with Suffocation or Napalm Death. DoC: What's next for Advent of Bedlam? We are working right now on the promotion of the Human Portal Phenomenon album. Some regional dates are being scheduled and we will focus on that, hopefully come back to Mexico and hopefully make it to the US soon! We are also working on new music so we can release new stuff pretty soon too!